Like hazard mitigation planning, disaster response and recovery requires a different approach to historic properties. Local governments and partner organizations can prepare ahead and, in responding to an event, ensure that activities are undertaken such as: sorting debris to store historic building components for salvage, requesting assistance from the Maryland Historical Trust to help with post-disaster assessment of historic buildings, and disseminating information on how to properly treat a historic building after a disaster. MHT has outlined its approach to disaster response and recovery in Chapter 2 of its Flood Mitigation Guide: Maryland's Historic Buildings. Additional resources can be found below. 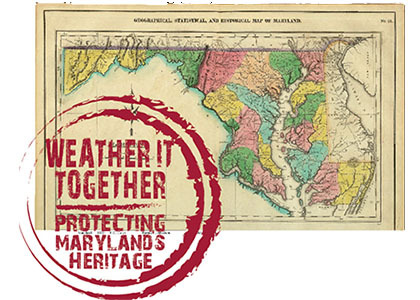 These fact sheets have been developed by the Maryland Historical Trust to assist property owners/occupants dealing with historic resources damaged by a natural disaster. State and federal preservation tax incentives are a tool that may be used to assist owners of certified historic properties as they undertake rehabilitation projects following a natural disaster. Whether you are planning to rehabilitate your primary or secondary residence or a commercial property, you may have the opportunity to earn a state income tax credit on qualified rehabilitation expenditures. Please note that Rehabilitation Tax Credits are awarded based on the eligible rehabilitation costs of completed projects and therefore do not provide any upfront financial assistance for the project. While participation in the tax credit program requires prior approval of work, we encourage anyone who has experienced damage to their historic buildings to contact our staff by telephone or email to gain information on ways we might be of assistance in the expedition of approvals or streamlining of our review process for emergency work. Appropriate staff contact information for the programs, depending on property types, may be found in the links below. In addition, if you have an open tax credit application, but experience damage to your property, you should contact appropriate staff for guidance even if you expect all damage to be covered by insurance. The MHT Capital Grant Program is not offering emergency grants at the present time. Please check the MHT Capital Grants web page for updates on availability of funding.